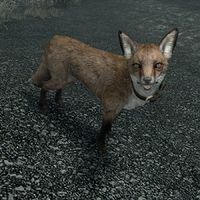 Sweet Roll is a trained fox found in the forest south-southwest of Half-Moon Mill. You can feed it a sweet roll to make it your pet. It comes pre-equipped with an Animal Collar but this can be taken off if you desire. It cannot wear an Animal Pack. It is essential and will not engage in combat. Sweet Roll can be summoned using a teleportation spell. It can be instructed to follow you even if you already have another pet following you. You can instruct it to wait at a city, wait at its current location (either temporarily or permanently), wait at your house, or to carry items. It can also be instructed to "go find something valuable", which will cause Sweet Roll to run to the nearest item of loot, such as valuable weapons, armor, jewelry, or certain miscellaneous treasure such as gems. [verification needed — need full list] If there is no such item nearby, you will receive a message stating that Sweet Roll couldn't find anything. Additionally, Sweet Roll may sometimes be holding a gem, soul gem, jewelry, or miscellaneous treasure when you talk to it, which the player can receive through a separate dialogue option. The Thief's Journal contains background information on Sweet Roll. This page was last modified on 16 January 2019, at 01:07.